The “undisputed global oil and gas leader”… the latest in gold-themed thrones… inflation, California style… and more! “Heads I win, tails I don’t lose,” said Jim Rickards. Our editors assembled in a hotel ballroom yesterday a couple of blocks north of Agora Financial headquarters in Baltimore. It’s during periodic gatherings like this that our contributors run their investment ideas before a tough crowd — their fellow contributors — in judging whether those ideas are “ready for prime time,” i.e., ready for recommendation to you, dear reader. Today we give you a glimpse into a couple of the most compelling ideas — starting with a new “asymmetric trade” from Jim. The asymmetric trade “is one of my favorite trading situations,” Jim went on. The classic instance of an asymmetric trade was Jim’s call on Great Britain’s “Brexit” referendum in June of last year. Conventional wisdom said a majority of voters would opt to stay in the European Union. The conventional wisdom was so lopsided that a trade betting on a shock victory for the “leave” faction would pay off huge… but if the “remain” side won, the trade would break even or at worst register a small loss. “Leave” carried the day… and Jim’s readers had the chance to pocket a 129% gain in three days. Something like the Brexit trade is about to unfold over the next 15 days with gold. Gold has edged up to $1,288 this morning — on the high end of a trading range where it’s been stuck for a month or so. Why so little movement? 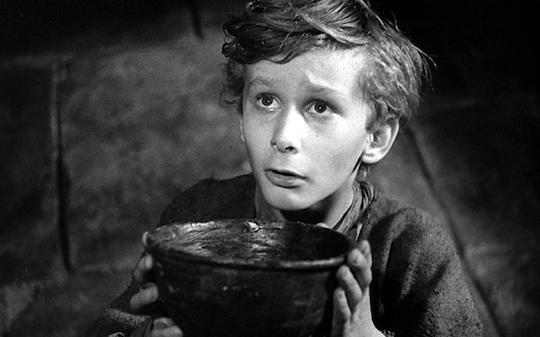 “The market is waiting for Godot, or more precisely the Fed FOMC meeting on Dec. 13,” according to Jim. This morning, traders in fed funds futures are pricing in a 96.7% probability of the Fed raising its benchmark fed funds rate come Dec. 13. But what if confirmation never comes? If you’ve been reading regularly in recent weeks, you know Jim doesn’t buy the conventional wisdom about a December rate increase baked into the cake. The Fed’s preferred measure of inflation — it’s called “core PCE” — has been falling much of this year and now stands at 1.3%. That’s way below the Fed’s 2% inflationary sweet spot. The next reading on core PCE from the Commerce Department is due on Monday, Nov. 30. So, if you choose, here’s the resulting asymmetric trade from Jim: “Buy gold today, and then wait to see what the PCE core number is on Nov. 30. “If it’s hot (1.6% or higher), the Fed will hike rates. You should be able to unwind the gold trade if you like with little or no harm done. If it’s weak (1.3% or lower), which I expect, the market will start to reprice for a ‘pause’ and gold will be off to the races. Our income specialist, Zach Scheidt, meanwhile, announced the launch of a financial tool so powerful it’s been investigated by the SEC — twice. Zach goes back to his days as a hedge fund manager when his firm rented office space from Bear Stearns. He used their technology and trading platform… and even took advantage of something called the squawk box. The squawk box looks a little like an airplane’s black box. While an airplane’s device records the past, the squawk box broadcasts the future… at least, what analysts believe the market’s future will be. “The box was responsible for giving Bear Stearns traders access to the most profitable opportunities day in and day out. And since I had a squawk box on my desk,” says Zach, “I had access to the very same profit opportunities typically hidden behind Wall Street’s cloak of secrecy. This is a brand-new service, so details are still being hammered out. But as they emerge, The 5 will make sure you’re in the loop so you get instant access to LIVE weekly calls with Zach. After three trading days of not much to talk about, the major U.S. stock indexes appear set for another blip down. We’re writing on the early side today, and Dow futures are down a little over 100 points. The mainstream, as usual, is fumbling for explanations — falling oil prices, uncertainty over the tax plan in Washington. The idea that the market might just be due for a rest after notching a bunch of record closes in October and early November? Nah, that’d be too easy! Trader chatter includes the latest 13F filing from Berkshire Hathaway: It’s been months in the making, but IBM can no longer be counted among Warren Buffett’s “Big Four” holdings. As 2017 has worn on, IBM has been supplanted by Apple and Bank of America — in addition to longtime holdings American Express, Coca-Cola and Wells Fargo. Retail sales: Up 0.2% in October, more than the “expert consensus” was counting on. A continued hurricane-fueled surge of auto sales helped. From Washington, meanwhile, comes news that the latest version of the Senate tax plan would have all the tax cuts for individuals and pass-through businesses expire in 2025, at which time we’d return to current rates. If you like your tax cut, you can keep it? For the record: The United States is on track to become the “undisputed global oil and gas leader,” per the annual forecast from the International Energy Agency. Between oil and gas combined, the IEA says the United States became the globe’s top producer in 2012. From now till 2025, the IEA forecasts America will account for 80% of the increase in worldwide production. That’s the power of shale deposits that have become cost-effective to exploit with the newer horizontal drilling and hydraulic fracturing (“fracking”) technology. And the world will need it. For all the talk of electric vehicles supplanting gasoline and diesel, the IEA says global energy demand will rise 30% by 2040, thanks largely to higher consumption in India. We daresay the IEA might be optimistic about U.S. ability to supply all that demand: Shale deposits deplete much more quickly than traditional oil deposits. In many cases, most of the good stuff is gone after just a couple of years. From Europe comes an idea we suspect won’t stay in Europe — an end to deposit insurance on bank accounts. Veteran gold-watcher Jan Skoyles — she hangs her hat these days at the Irish-based bullion dealer GoldCore — has discovered a position paper the European Central Bank published a week ago. It proposes revisions to the ECB’s current guidelines for handling a financial crisis. The paper does not explicitly say the current protections on deposits up to 100,000 euros — about $118,000 — should be scrapped. What constitutes “an appropriate amount”? OK, Venezuelan president Nicolás Maduro can’t call it a “refinancing and restructuring” anymore: Standard & Poor’s has declared the government in default on some of its bonds. So far there’s no evidence of a domino effect on other markets or asset classes. But we warned about the possibility here seven months ago. Now it’s crunch time. Speaking of Zimbabwe, how ’bout that coup? The military isn’t calling it a coup (any more than Maduro said Venezuela is in default), but the aging dictator Robert Mugabe is under house arrest as we write. You never know what it’ll take to prompt a military coup. Hyperinflation that made possible a $100 trillion bill? Mugabe gets a pass. Setting up his wife to be his successor instead of the vice president? Mugabe’s gotta go. So how can you possibly top the fully functioning solid-gold toilet installed at the Guggenheim Museum in New York last year? 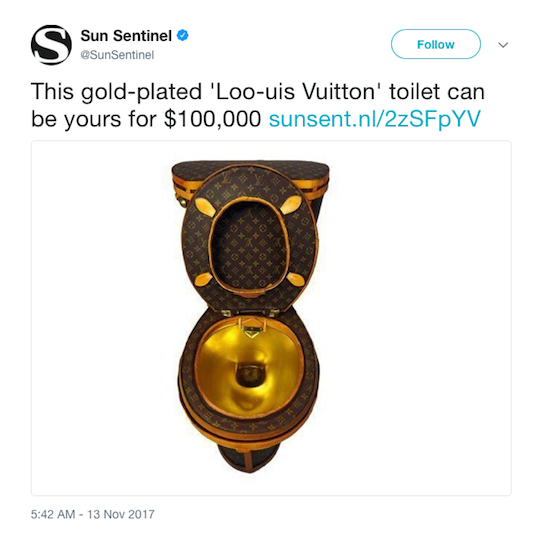 From The Palm Beach Post: “Controversial artist Illma Gore worked for three months and used 24 different bags, valued at $15,000, in addition to a $3,000 suitcase to make this fully functioning potty, according to Tradesy, where it’s listed for sale. “The lavatory will ship from California, and its anticipated arrival is within four–eight days.” All sales are final. Inflation is the topic du jour in the mailbag: “As someone recently mentioned,” a reader writes, “it is the excess money production in relation to economics that results in price inflation — but with the latter receiving most of the flak. “California has its own brand of creating inflation, not by private production and sales but by increased gas taxes (after encouraging less fuel use). Beginning Nov. 1, we now have increased state excise taxes on gasoline of 12 cents a gallon and 20 cents on diesel (probably because diesel cars and trucks are more fuel-efficient and easy targets). Of course in response, the retailers increased gasoline prices by double that, about 25 cents a gallon! Retailers, to my past knowledge, only earn about 10–13 cents a gallon; who is gouging here? “Oh, and California double-taxes gasoline/diesel by charging its state sales taxes on the gross price of fuel, including on the excise taxes, both federal (18.9 cents) and state (now, I think, about 42 cents; the state adjusts its excise tax to guarantee itself a certain minimum floor income regardless of the total fuel bought by society). The 5: And because Californians are leading the way in adopting electric vehicles — thus reducing gas tax revenue — the state plans to tack on an EV surcharge to the annual auto registration fee starting in 2020. P.S. Did you play it? Yesterday, Jonas Elmerraji urged his premium subscribers to collect a 110% gain after only a month’s holding time — a textbook “K-Sign” trade. Learn more about how K-Signs can supercharge your portfolio when you follow this link.